These three Buffett-owned stocks look like excellent bargains right now. Warren Buffett-led Berkshire Hathaway (NYSE:BRK-A) (NYSE:BRK-B) has a portfolio of about 45 stocks, much of which reads like a who's who of great American businesses. With the market still close to all-time highs, it's only natural that some Buffett stocks look pretty expensive right now. However, there are still a few that look cheap and are worth a closer look. In fact, I own two of these in my own portfolio, and I'm strongly considering adding the third. If you recall the buildup, or lack thereof, to Apple's (NASDAQ:AAPL) iPhone 7 event, you'll remember that the experts didn't exactly have high expectations for the latest Apple products. Well, at least for now, it looks like the experts were wrong. Sprint recently reported that preorders for the new iPhones are four times higher than last year's, and T-Mobile went even further, saying that its preorders were the highest in history. Additionally, most critics have given the new phones unexpectedly positive reviews. Even the new Apple Watch Series 2 is getting praise by critics. One review by The Verge even said that the Apple Watch has finally found its focus primarily as a fitness tracker, and a very good one at that. With water resistance, built-in GPS, a larger battery, and faster performance, sales of the Apple Watch could certainly surprise the market. Although Apple stock has popped a little bit since the product announcements were made and the reviews started coming out, share still look remarkably cheap. As of this writing, Apple trades for just 12.6 times trailing-12-month earnings (which is even better than it sounds considering Apple's massive cash hoard). While a small earnings drop-off was projected in 2017 by analysts, I wouldn't be surprised if Apple's third- and fourth-quarter numbers shatter the market's expectations, given the extremely positive reception of the new gadgets. 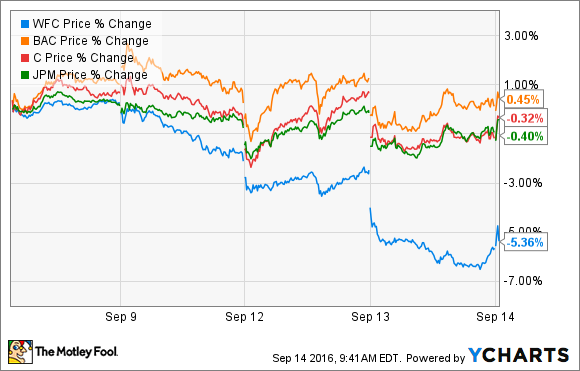 To be perfectly clear, Wells Fargo (NYSE:WFC) did a bad thing. If you haven't heard, Wells Fargo was fined $185 million recently for fraudulently opening about two million deposit and credit card accounts without its customers's consent. However, it's important to put the recent events into perspective. First of all, even with the recent fines, Wells Fargo is still the least-fined of the big four U.S. banks, as my fellow Fool John Maxfield recently pointed out. If you add up the fines paid since 2009, Wells Fargo is a distant fourth out of four, trailing the next closest bank (Citigroup) by nearly half. And the bank has taken measures to ensure these deceptive sales practices are behind them. The 5,300 employees who participated have been fired, and Well Fargo has removed product sale requirements from its retail banks -- the primary reason employees felt pressured into opening the fake accounts in the first place. Wells Fargo is still a well-run bank, even when considering this scandal. It is among the most profitable of all U.S. banks, earning respectable returns in a challenging low-interest environment, and does an excellent job when it comes to managing risk. WFC Price data by YCharts. Since the wrongdoing was made public, Wells Fargo shares have dropped considerably, underperforming the other U.S. big banks by a significant margin, as you can see in the above chart. In fact, it was recently overtaken by JPMorgan Chase as the largest U.S. bank by market capitalization. Berkshire is Wells Fargo's largest shareholder, and has actually lost $1.4 billion in value since the news broke. However, I believe Wells Fargo is a strong buy on any weakness, and is becoming more and more attractive as this story plays out. Most people don't think of Bank of America (NYSE:BAC) as a Buffett stock, since it's technically not included in Berkshire's stock portfolio. However, Bank of America is actually Berkshire's fourth-largest equity investment. In the years following the financial crisis, Buffett made a rather savvy investment in Bank of America, acquiring $5 billion worth of preferred stock paying 6%, and receiving warrants to buy 700 million shares of the bank for $5 billion at any time prior to September 2021. Well, fast-forward a few years, and 700 million shares of the bank are now worth about $11 billion -- a pretty nice return. Even so, Buffett has no desire to unload his investment anytime soon. It's easy to see why. Bank of America has improved tremendously since the crisis. Capital levels are strong, credit risk management has gotten much better, and the bank's operations have become more efficient. 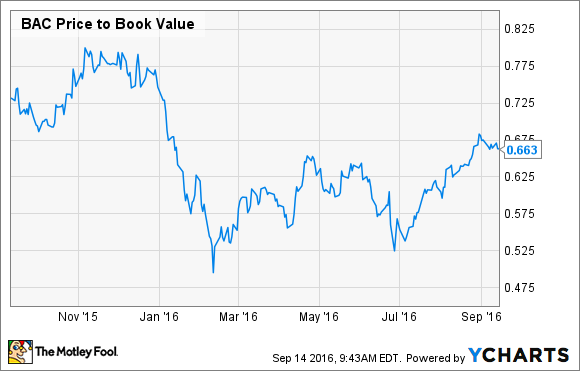 Plus, due to its current lack of profitability, Bank of America trades for a big discount to book value. BAC Price-to-Book Value data by YCharts. Once interest rates begin to normalize, it could catapult the bank's profits higher, and take the stock's valuation with it. Buffett said in his 2015 letter to shareholders that Berkshire is likely to purchase the shares just before the options expire and said the investment was "one we value highly." If you decide to buy any of these three stocks, be sure to do so with the long-term in mind -- say, five years at a bare minimum. This is especially true with the two bank stocks. It's entirely possible that the short-term fallout from the Wells Fargo scandal could push the stock down further in the weeks and months to come, and if interest rates rise slower than the market expects, it could be a negative catalyst for Wells and Bank of America. Even Apple isn't immune to short-term headwinds – sure, pre-orders of its new product line look great, but if next year's iPhone is a flop, it could easily push the stock price down. The bottom line is that all of these stocks are long-term winners, but can be quite unpredictable over shorter periods of time. So, invest with that in mind.